1. A busy work schedule means that I spend some nights at my parents’ house (they live about 3 minutes from my office, whereas I live over an hour away). 2. There have been many football games and other extracurricular activities on my radar lately, meaning that I’ve been out of the house a lot on the weekends. 3. I’m going out of town tomorrow to visit this crazy girl. The combination of those circumstances means that I haven’t been to the grocery store in, oh, about a month. My next reunion with Trader Joe’s will be a pretty big deal, let me tell you. So clearly, other than parading around food that came from my parents’ refrigerator, I haven’t been producing a whole lot of interesting content for ye olde blogge. I tried another Trader Joe’s frozen meal last night! 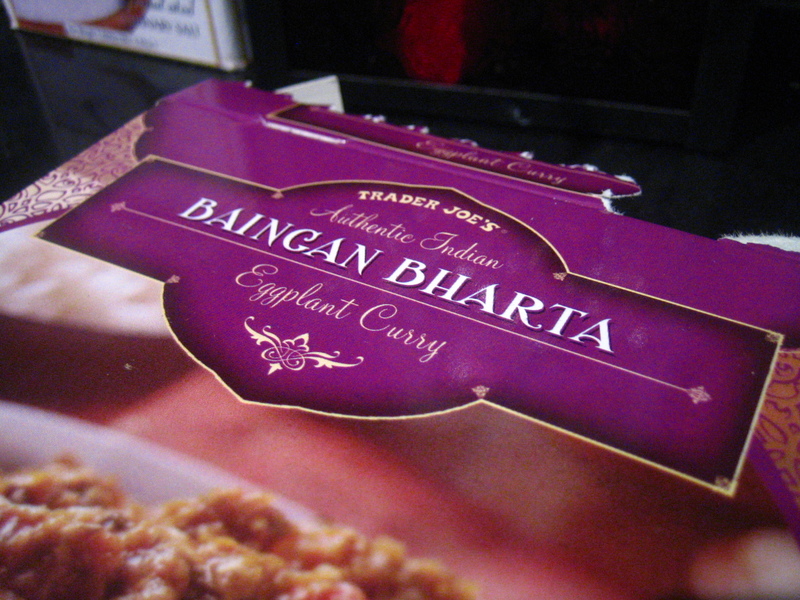 I picked up this baingan bharta from Trader Joe’s a few weeks ago, in hopes that I’d serve it to my bookclub when we met to discuss Shantaram. The story takes place in India, so I thought it would be appropriate. By the way, that is the best book I’ve read in recent memory- if you need a good, lengthy novel, go read this immediately. Turns out that bookclub meeting sort of fell through, so this guy was hanging out in my freezer for a few weeks before I broke into it. Incidentally, the sad part about the fact that I heated this up last night is that I have these two eggplants sitting in my fridge, waiting for me to do something with them. They’re so sad in there all by themselves. 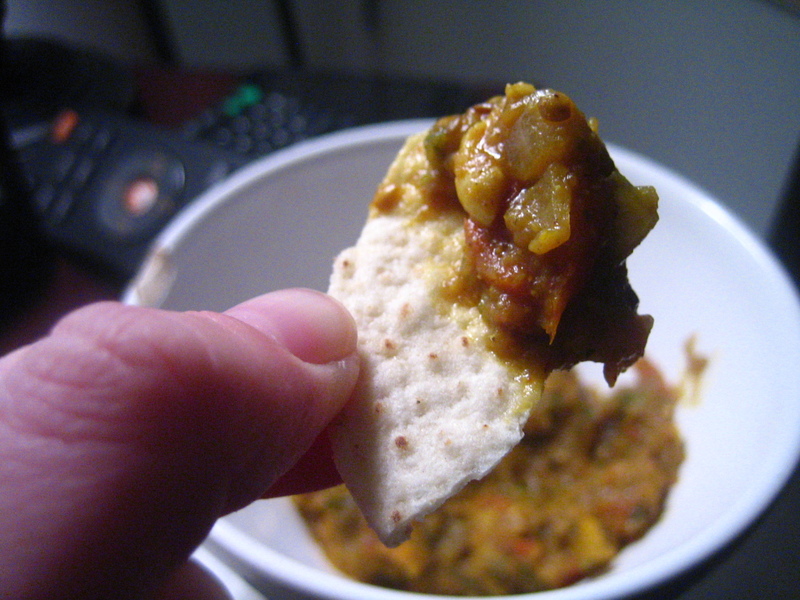 Anyway, this was actually a pretty decent Indian dish out of TJ’s freezer section; spicy (but not too hot) with some good texture. And of course, because I’m classy and have nothing else on hand, I ate it with chips. At least I managed to feed myself, right? Pretty sure I made it possible that I will not have to use my kitchen hardly at all until after I return on Sunday. I’ve been hearing great things about TJ’s frozen Indian meals. It’s always so hard though when we have so many delicious (cheap) Indian restaurants near by. What’s a girl to do? I love eggplant and I’ve never had Baingan bharta. That’s a serious deficiency. A girl I work with just read that book. She LOVED it. I really need to read that book, I think you told me about it before and shockingly I still haven’t picked a new book to read. And everything is better on chips. EVERYTHING, I say! I was doing pretty good about grocery shopping and cooking, but this week it went to the dogs. I am living off the pantry until next week it seems. I’ve been meaning to try that TJ’s meal though. Their Indian dishes are usually really good. Busy lady!! That’s gotta be convenient to crash at your parent’s house every now and then 🙂 I wish I could try more TJ’s frozen meals – I should have stocked up last weekend. I can really only get them in the winter, since they’d melt on the two hour car ride home in the summer. I’ll have to try that! 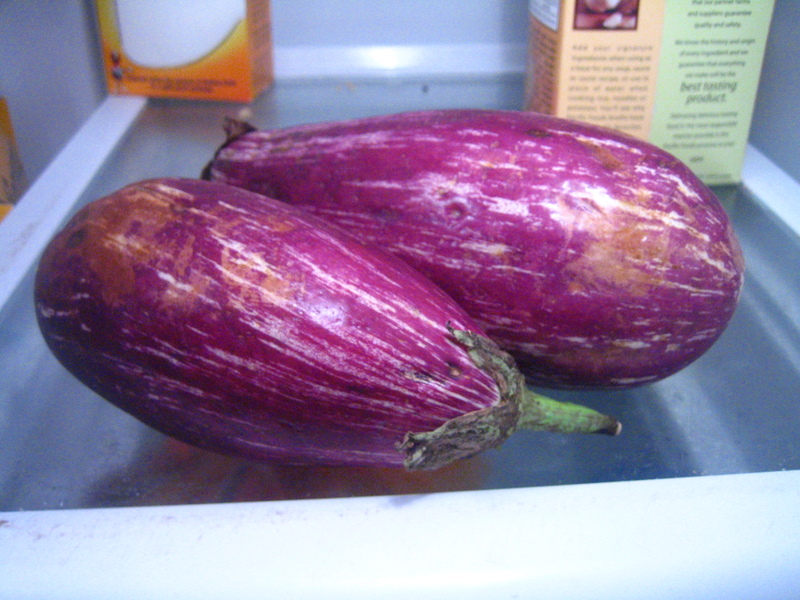 I LOVE their pouch variety – I always saute eggplant and then add the contents of the pouch – so good! I love EGGPLANT! This post is making me very, very hungry.